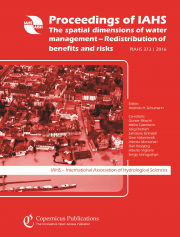 Since September 2014 the online open-access continuation of the IAHS Red Book series, Proceedings of the International Association of Hydrological Sciences, or PIAHS, has been published by Copernicus Publications on behalf of IAHS. The Editor-in-Chief is Christophe Cudennec, the IAHS Secretary General. Future papers published in the IAHS proceedings journal will be free to view/download, and so visible to a worldwide audience. The metadata for each paper are available to indexing organisations and citations will be recorded. Print copies of PIAHS volumes are available to order. Innovative water resources management – understanding and balancing interactions between humankind and nature. Papers are published in PIAHS by invitation only after selection and review of abstracts/papers submitted for presentation at an IAHS event. Anyone wishing to submit a paper to PIAHS should arrange to present a paper at a forthcoming IAHS event (see the IAHS Calendar). Suggestions for topics for IAHS events should be made to officers of the IAHS Bureau, Commissions or Working Groups. As with other open-access journals, it is necessary for authors to pay for publication of their paper. Depending on the event the volume is associated with, this may be incorporated into the registration fee for the event, or direct payment to Copernicus Publications may be necessary. Copernicus’s online publication fees are low compared to other publishers; IAHS/event organizers may subsidize costs for authors from financially-disadvantaged countries. The backfile of earlier IAHS Red Books/proceedings volumes remains at the IAHS website; abstracts of papers in all recent volumes are available, and PDFs of the full papers in volumes 1–325 are free to view/download. Uploading of full papers of more recent volumes will continue and eventually all will be freely available online.